In our first talk of 2019 Harold Hoggarth returned to entertain and inform us with the tales of three local women, Selina Cooper, Katharine Glasier and Ethel Snowden who were involved in the fight for women’s suffrage. All these women did remarkable work in addressing the social situation and conditions of their time, however, the principal of the three warriors could be said to be Selina Cooper. After moving ‘oop North after the death of her father she started work age thirteen, in the mills of Barnoldswick. She took courses in First Aid, laundry and hygiene and also became self educated. 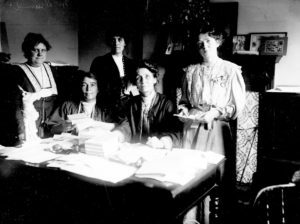 After joining the Women’s Co-operative Guild she became part of the North of England’s Society for Women’s Sufferage in 1900. 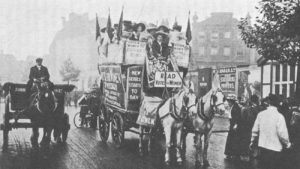 As the movement grew she rubbed shoulders with Emmeline Pankhurst and with three other women presented the case for women’s sufferage to Prime Minister Herbert Asquith. Her stance would have given local women the courage to stand up for their rights in a non violent way. However it was her work in the local area that would also have impacted on the lives of the community which also still endears her to us today. Selina became active in local social issues such as the Nelson Education, Health Insurance and Public Assistance Committees and became a JP. She instigated and developed the first ever Maternity Centre in Nelson which will have helped good health to continue down the generations. Her life seems to have been a tireless example of service to others. 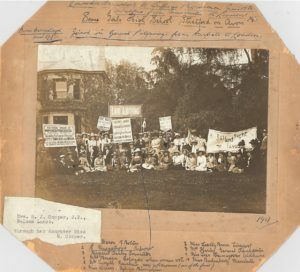 The picture on the right depicts Lancashire Suffragettes who marched from Manchester to London perhaps resting at a Girls High School in Stratford on Avon. As it originally belonged to Selina Cooper JP she is probably in the photograph. From her daugher Miss M. Cooper. Katharine Bruce Glasier of Earby achieved a Bachelor of Arts and after joining the Fabians was instrumental with others in founding the Independent Labour Party. Both she and her husband worked for social reform. Katharine became an author and the editor of the ILP newspaper alongside being a national organiser of the Labour Party. She died in 1950 leaving her home in Earby, Glen Cottage to the YHA. Amongher other achievements she was instrumental in instigating pit head baths and the setting up of the Margaret Macmillan Memorial College. Ethel Annakin became Viscountess Snowden, after her marriage to labour activist Phillip Snowden and his achievement of Viscountcy. Although from a middle class background she becam a socialist aligning with the Fabian Society and later the Independent Labour Party. She earned an income from lecturing in Britain and America. Ethel was a leading campaigner for Womens’s suffrage and went on to found The Women’s Peace Crusade. Her criticisms of the Soviet Union made her unpopular on the Left. In later years she became a Governor of the BBC and Director of the Royal Opera House. When enthusiastic about a subject she was said to disregard anything that stood in her way and it was said that “tact or discretion were foreign to her nature”. In her book “The Woman Socialist” in 1907 she advocated state control of marriage, joint title by women to the housekeeping money, and a state salary for mothers, she also wanted housekeeping organised collectively in each street and declared that under socialism women would have “no need to paint face and tint hair”. Perhaps laying the foundation for the Child Allowance in later years to be paid to the mother not the father. “To lead a great life: Dream, Take Action, Repeat” Selina Cooper and her like did this ‘in spades’. Banner Image: A cohort of local Sufferagettes and supporters. Selina Cooper is probably far right, front. At the station on their way to a protest. Courtesy of Lancashire Archives.